Editor’s note: There is at least some truth in this article about the killing of Mr. Todashev. Truth and cautious investigation by the major, contrived media? It’s a start. From here, the investigation can build. According to Taramov, FBI agents "were pushing him, saying, 'Stay, don't leave.' They said, 'We want to interview you one last time and talk to you a last time.' And he decided to stay, and today's interview was supposed to be the last time, and they said they were going to leave him alone." They (all three friends) told the Orlando Sentinel the interviews and surveillance began two days after two Chechen brothers — 26-year-old Tamerlan and 19-year-old Dzhokhar Tsarnaev — were identified as the suspected bombers. The three friends said all of them — including Todashev — shared the same sense of outrage over the bombing in Boston. And none had heard of a triple-murder there a couple of years ago in which their friend was allegedly a suspect, they said. None of the roommates considered Todashev a political or religious radical, saying simply that he was faithful to their shared religion. Initially, FBI officials said Todashev, 27, became violent and lunged at an agent with a knife while he was being questioned about Tsarnaev and an unsolved 2011 triple murder in the Boston suburb of Waltham. The agent, acting on an "imminent threat," then shot Todashev, they said. However, later in the day, some of those officials had backed off that preliminary account, and it's no longer clear what happened in the moments before the fatal shooting, The Associated Press reported. 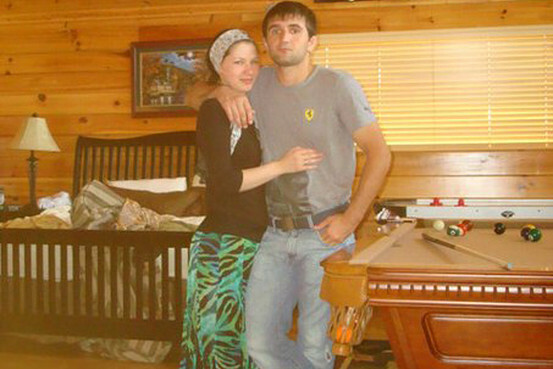 Read more: http://www.myfoxorlando.com/story/22403812/fbi-shooting-orla..
Update 4: Newest FBI story about the Chechen they killed today in FloridaHe 'confessed' to the murders of Tamerlan's sparring partner and friends....and then attacked them. 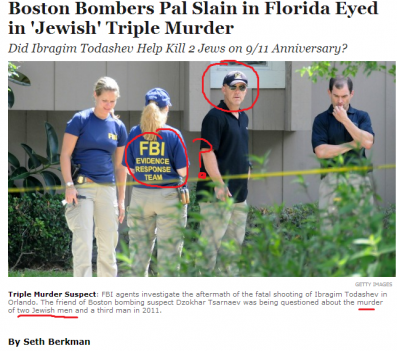 May 22, 2013 - A man with ties to the Boston Marathon bombing suspect Tamerlan Tsarnaev was shot and killed by an FBI agent while being questioned in Florida, law enforcement officials said on Wednesday. The man who was shot, Ibragim Todashev, 27, was not suspected of having played any role in the bombing that killed three people and injured scores more in April, they said. WESH-TV in Orlando reports that Todashev was originally cooperative, but he was shot after attacking an FBI agent. “During the confrontation, the individual was killed and the agent sustained non-life threatening injuries,” the FBI told ABC News. Khusn Taramiv, a friend of Todashev, said they were interrogated about the Boston bombing. “(The FBI) took me and my friend, (Ibragim Todashev). They were talking to us, both of us, right? And they said they need him for a little more, for a couple more hours, and I left, and they told me they’re going to bring him back. They never brought him back,” Taramiv told WESH-TV.